Syntheyes, available at http://www.ssontech.com, is one of the fastest, feature-rich and yet surprisingly inexpensive camera-trackers out there. This tutorial not only gets you started with basic and advanced tracking, but will also dig deeper into the vast feature tool-set of Syntheyes that goes way beyond simple tracking. For starters we'll use a simple shot and do the most obvious thing when you first open Syntheyes: A completely automatic track. In a matter of literally seconds you'll have a pretty usable result, that will quickly improve by using some simple clean-up techniques. Orient the scene in 3d-space and insert 3D-objects into your scene to test if everything works, export your camera-solution and voila - you have a decent matchmove in just a few minutes. Life not often makes it easy for you, and so you'll often be confronted with things like motion-blur, camera-shake and lens-distortion. So for the more difficult shots we'll have to bring the big guns in. Automatic tracker cleanup, manual control over each tracker-curve in the graphs-editor and fine-tune trackers can really improve your camera solution. To solve fast and shaky hand-held footage with lots of motion-blur it's best to use supervised tracking to give you the most control over each tracker. If you're footage was shot with a lens that has barrel-distortion then you have another problem that can make things more complicated. Tracks will have lots of errors, and 3D objects will not fit to the footage not matter what. Luckily Syntheyes has a clever way to get rid of lens-distortion. Or even to re-distort the CGI, if the director wants to work with the original footage later in compositing. With the tracking-features and resulting 3d-points you can not only define the camera, but also re-model the scene, just use the points to define a mesh! And if there are not enough features for you to re-create the scene, insert zero weighted trackers (ZWT) that don't affect the camera solution but will position themselves in the correct place in your 3d environment. And if you need more organic shapes to be rebuilt, add thousands of 3d-points all at once to build your mesh. You can even texture that mesh by using camera-projection right within Syntheyes, to test if camera-mapping will work later in your 3d- or compositing-application. Solving Tripod shots - with 3d environment? The common problem with tripod shots is that it is impossible to get any usable 3d information out of just a camera-pan. The solution of the camera movement might be good, still it can be hard to position it in a reasonable and exact way in 3d-space. That problem can quickly be solved with Syntheye's lens-tools. Use any straight perspective lines in one frame of your tripod-shot to setup a coordinate system that let's you position objects in your scene more easily - that makes life easier for the 3d-artist! You can even use that method on still images. A moving camera - and a moving object! 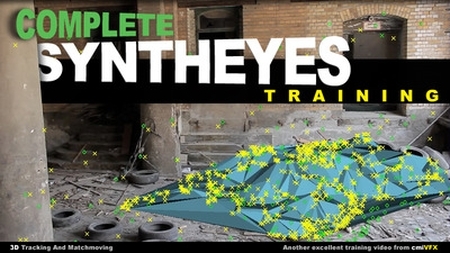 Although primarily a camera-tracker, Syntheyes does a really good job at object-tracking. The last chapter of this tutorial shows you how to track camera and objects in one scene altogether, how to setup their coordinate systems and how to orient them in 3d-space. You can really do amazing things with this great software. Make sure you have some time and your favorite compositing and 3d application at hand! You'll want to try out all these goodies immediately! cmiVFX Complete Syntheyes Training  Fast Download via Rapidshare Hotfile Fileserve Filesonic Megaupload, cmiVFX Complete Syntheyes Training  Torrents and Emule Download or anything related.